Synopsis: I read once that water is a symbol for emotions. And for a while now, I've thought maybe my mother drowned in both. 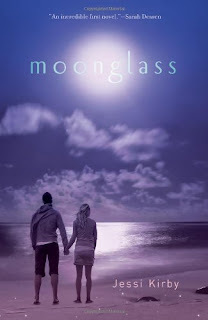 Moonglass is a beautifully written and heartbreaking story about love, loss, friendship, regret, and moving on. I enjoyed watching Anna learn life lessons – like that people aren’t always what they appear – and grow as a person. All the characters were great, both main characters and secondary ones. I loved Anna, her dad, Tyler, her dad’s best friend, Anna’s new friends Ashley and Jillian, James the lifeguard, everyone. They all had something to teach Anna. I appreciated that even though there were elements of romance in the book, the romance itself wasn’t the main storyline. Anna and Tyler liked each other, but they didn’t get together instantly and they weren’t inseparable, needy characters. The story was more about Anna’s journey and the lessons she had to learn, rather than her relationship with Tyler. I did like them together, and I enjoyed the scenes where they were sort of trying to figure each other out and become more than friends. I really liked the fact that this book was short – just 232 pages. So many books are unnecessarily long and add so much filler that at times, it’s easy to forget what the story is really about. The reader doesn’t get a chance to get side-tracked with Moonglass, because it’s short and to the point. I wish more books were like that. I know a few people who have been put off by this book because they heard it was sad, but don't let that stop you from reading it. It's such a lovely story, and so well-written, that even though it is heartbreaking, it's totally worth it. I often try to stay away from books where a parent has died because it hits so painfully close to home, but I would recommend this book to anyone. Great review Mary! I hadn't heard of this one before but it sounds very good - eventhough it's sad. Sometimes I'm in a mood for emotional books. I'll definitely check this one out. I'm happy to read such a positive review of this book, I got it somewhere in my TBR pile but I Wasn't too sure about it.